Learn what makes the Mac Security Plus app dodgy and get informative insights into the methods to remove this scareware from Mac in a few simple steps. One of the telltale signs of scareware activity is the influx of scans that the user never ran, along with irritating popup alerts that diminish the admin’s experience. What’s the point? It all comes down to money. The makers of these pseudo system utilities try to scare the victims that their Macs aren’t safe and healthy and then offer a “cure” for a registration fee. Whoever is behind the app called MacSecurityPlus (Mac Security Plus) chose not to go off the beaten track. This piece of software pretends to check the host system for various types of malicious code as well as performance issues. In doing this, though, it doesn’t get beyond pretending. The scan reports are going to be stuffed up with detected items, including trojans, viruses, privacy problems, memory congestion, lack of disk space, unused languages, unnecessary files, and similar concerns. In addition to the annoying scans that appear off and on, the Mac Security Plus malware displays popup alerts that reiterate the purported necessity of cleaning up the computer. Unless the victim is okay with closing these dialogs one after another, such an interference is a big nuisance that doesn’t get along with normal Mac usage. This is a component of the intimidation tactic that feigns extra urgency and encourages the target person to take immediate action. To make matters worse, the permanently splashing phony scans and nag screens have a considerable system footprint and may slow the Mac down to a crawl. In some cases, the virus may hijack Safari or other default browser and redirect it to deceptive landing pages that echo the allegedly unsatisfactory safety and performance condition of the host machine. Although the installation of the Mac Security Plus virus is always a trespass, the process involves certain action on the user’s end. The problem is that people fail to notice the untoward occurrence. The common entry vector exploited by the cybercriminals is what’s called bundling. It’s not an offensive mechanism per se, being a major monetization means for freeware authors. The gist is to push malicious or potentially unwanted applications (PUAs) as part of complex setups for programs that don’t require payment. In the upshot, Mac users believe they are installing one thing that’s harmless but end up additionally authorizing concomitant shady entities to infiltrate their machines. This is the fundamental reason to refrain from agreeing to the express setup option and go for the custom one instead. This way, it’s at least possible to take a look at what’s being promoted into the bargain. To recap, Mac Security Plus is distributed in a furtive way. When inside and running, it frustrates the victim with frequent bogus scans and popup ads reporting problems that have nothing to do with the real state of things. On top of that, the virus deteriorates system performance and may tweak browser settings. Obviously, such a pest is subject to removal, with no other treatment being appropriate whatsoever. When confronted with malicious code like the Mac Security Plus virus on Mac, you can neutralize its toxic impact by leveraging a specially crafted system utility. The Freshmac application (read review) is a perfect match for this purpose as it delivers essential security features along with must-have modules for Mac optimization. This tool cleans unneeded applications and persistent malware in one click. It also protects your privacy by eliminating tracking cookies, frees up disk space, and manages startup apps to decrease boot time. On top of that, it boasts 24/7 tech support. 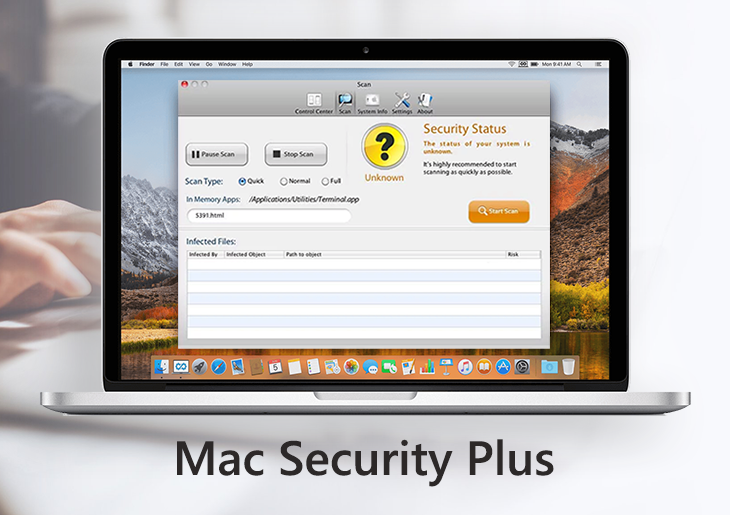 The following steps will walk you through automatic removal of the Mac Security Plus infection. Check whether the Mac Security Plus popups issue has been fixed. If it perseveres, go to the Uninstaller option on Freshmac GUI. Locate an entry that appears suspicious, select it and click Fix Safely button to force-uninstall the unwanted application. Go to Temp and Startup Apps panes on the interface and have all redundant or suspicious items eliminated as well. The Mac Security Plus malware shouldn’t be causing any further trouble.